Source: Digital galley courtesy of Bloomsbury USA Children’s Books. Thank you! Ten years ago, seven-year-old Samantha and her next door neighbor Remy watched helplessly as Sam’s little sister was kidnapped. Later, Remy and Sam identified the man and he was sent to prison. Now, Sam’s shattered family is returning to her childhood home in an effort to heal. As long-buried memories begin to surface, she and Remy wonder what they really saw. The more they re-examine the events of that fateful night, the more questions they have about what happened to Turtle . . . and they become more certain that Turtle’s killer is still out there, hidden amongst the members of their tight-knit community. Master storyteller Jessica Warman keeps readers guessing in an arresting page-turner that questions whether the potential for evil lurks within us all. 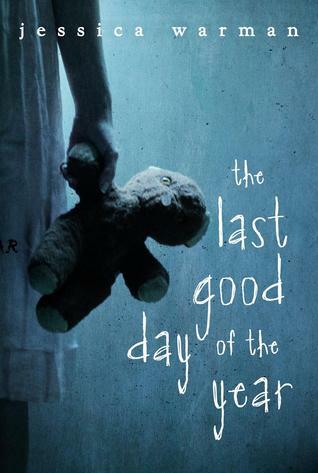 The Last Good Day of the Year is a young adult mystery that delves into a family swallowed up and divided by tragedy, past mistakes and what-if’s. For ten years Sam has had to deal not only with the horrific memories of watching, paralyzed, as her young sister Turtle was kidnapped from their home, but also with the private and media aftermath that followed. Now seventeen, Sam and her severely disconnected family return to their old home, their old neighborhood- and to her old childhood friend Remy. It is upon this joyless homecoming that Sam’s recollections about the months leading up to the kidnapping, memories about her neighborhood, her family’s friends, and her sister Gretchen really begin to swell and seethe. What did Sam and her friend Remy really see that night? Could Gretchen’s old acquaintance Steven really have kidnapped and killed Turtle? Why does Sam feel as though Turtle’s kidnapper is still out there in the neighborhood? Warman does a good job, I think, in creating Sam’s stifling, muggy and uncomfortably world, and in painting flawed, unfocused and arguably unlikable characters. The author paints Sam’s family life and their ever-present aura of sadness to great effect: Sam’s mother in particular is an intriguingly jarring and spiteful character, forever changed and scarred by Turtle’s disappearance and Gretchen’s connection with the kidnapper. Interwoven with the central mystery is the reunion (of sorts) of Remy and Sam. Remy is a peculiar, hazy, hard to pin down character; a young man you might not think Sam would be intrigued by or physically attracted to. I actually think their scenes together- when the focus is on a possible romance or an undefined chemistry instead of on Turtle’s kidnapping- is the least interesting part of the novel. Having Remy’s presence is important to fuel and ignite Sam’s exploration and eventual discoveries but I was not too big a fan of their romantic attachment. I think Warman did a great job at holding out the big reveal of the story; however (! ), all of the resolutions and events that happen post-reveal are, in my opinion, too quickly done. I would have appreciated a lengthier wrap-up to the story as the lead-up seems so carefully plotted and drawn-out. The majority of the story is, in fact, a slow and focused build-up to Sam’s newfound discoveries about the night and aftermath of the kidnapping and Steven’s trial. This is why the sudden purge of revelations and brief conclusions read as incongruous with the rest of the novel. The closing paragraphs may drive some readers bananas with frustration, but whatever your take, it will probably leave you thinking, contemplating and wondering at possibility and truth. Overall, The Last Good Day of the Year is an interesting and altogether melancholy YA mystery that readers may likely zip right through to get to the end and the ‘what-happened?’. Fans of Jessica Warman’s previous novels, readers who enjoy the work of April Henry, Alice Sebold’s The Lovely Bones, Brenna Yovanoff’s Paper Valentine, or Mariah Fredericks’s The Girl in the Park might be especially interested in reading this novel. I received this book as a digital galley from Bloomsbury USA Children’s Books via NetGalley in exchange for an honest review.